I've had a really nice spool of Invisafil fine thread for some time now. I've been wanting to try to use it on a small project to see how it works. After last weekends guild autumn themed strip swap, I thought I'd use Lee's square in a square block design to make a quick 24 x 24 table runner. 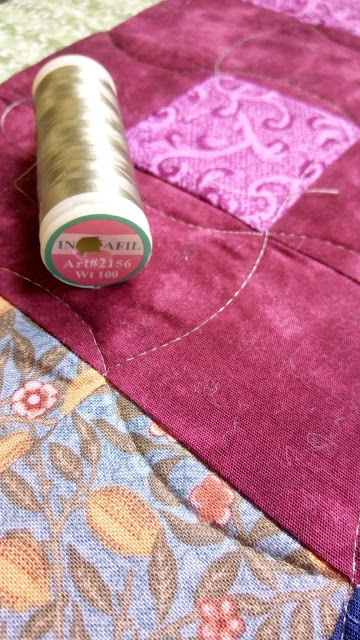 Then I would quilt it and try out the fine thread. Turns out it was a bit of a disaster. I couldn't figure out why. The thread broke over at least dozen times. No matter how slow I stitched, it broke. After it broke for the third time, I decided I have too much time invested to rip out. I continued on. I tried giving the thread more space, by moving the spool away and give it a long guide... like 5 feet.... Still not better. I persevered. It's done. I looked at the end of the spool. No wonder I had trouble. It's 100 weight. Darn. I knew it was thin, but I thought it was 60 or 80 wt. No wonder I had troubles. Gesh. After all that, I do like it. 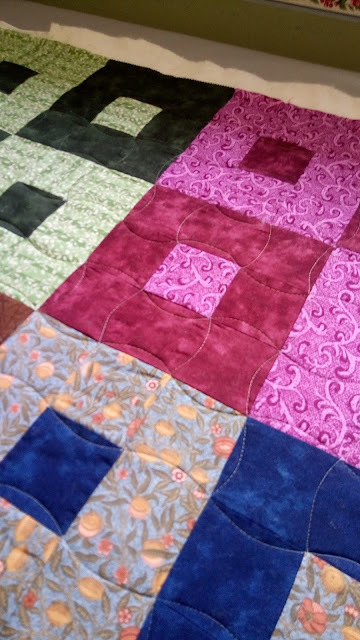 I wanted the quilting to just be subtle. 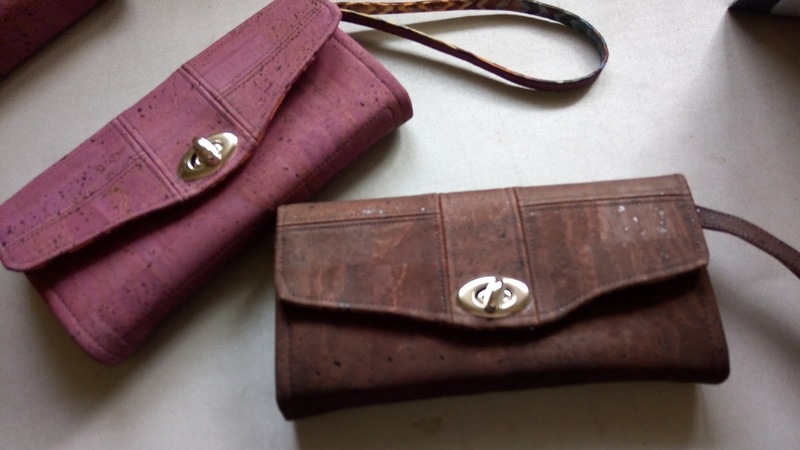 It's quilted in an apple core although it's hard to tell because of the fine thread. 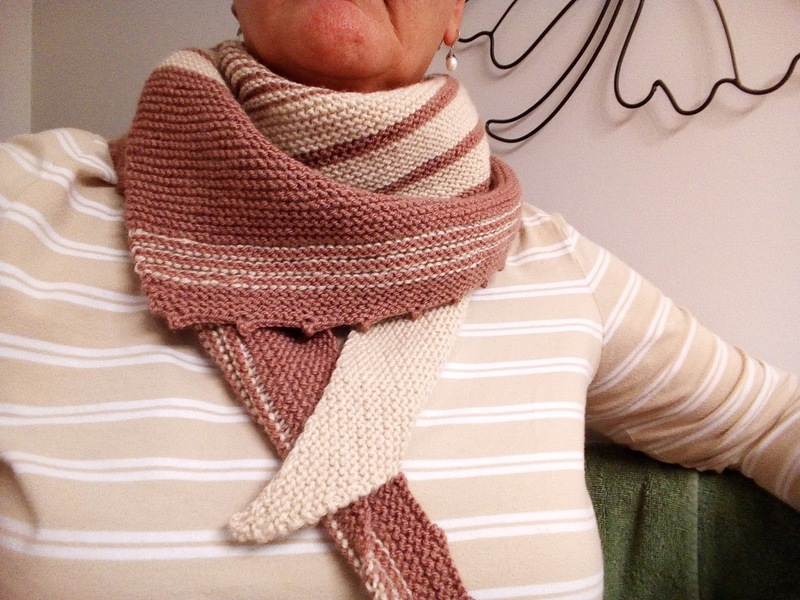 Too Hot to Wear a Shawl. On the Labour day holiday, I took advantage of the free Crafty video day. I know they have fabulous quilting videos, but they also have great cooking videos. 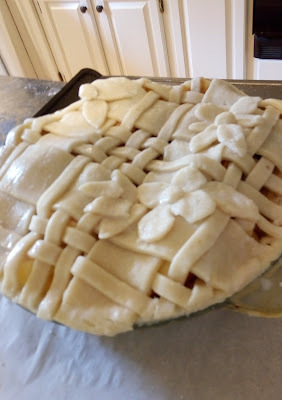 Among others, I watched a Pie making class. The instructor, Gesine Bullock-Prado was fun to watch as she demonstrated.. She made several pies starting with her signature lattice pie. I loved the look of this pie. I couldn't wait to try it myself and today was the day. I tried a few of Gesine's pie crust making and rolling techniques that were different than the way I do it. Her techniques worked for me, and I will continue to do them her way. But first, I chose to continue to use my own pie crust recipe and not hers. 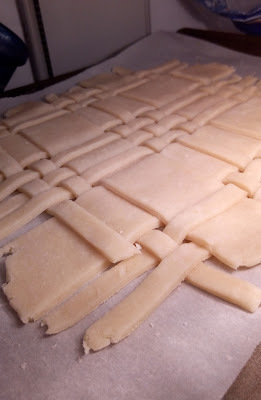 I had to increase my recipe to allow for the extra dough needed for the lattice. 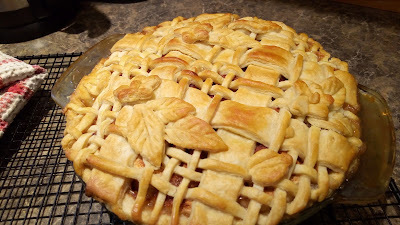 By now the top lattice crust is firm enough to place on the top. 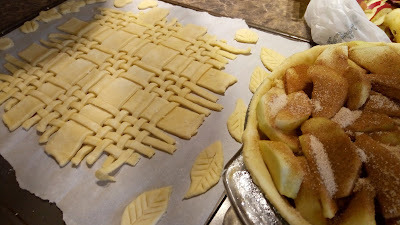 I carefully position on top, trim excess dough, and it's ready for the oven. The little flowers are just sweet and just in case the dough cracked or messed up, you can use the flowers to hide a booboo. 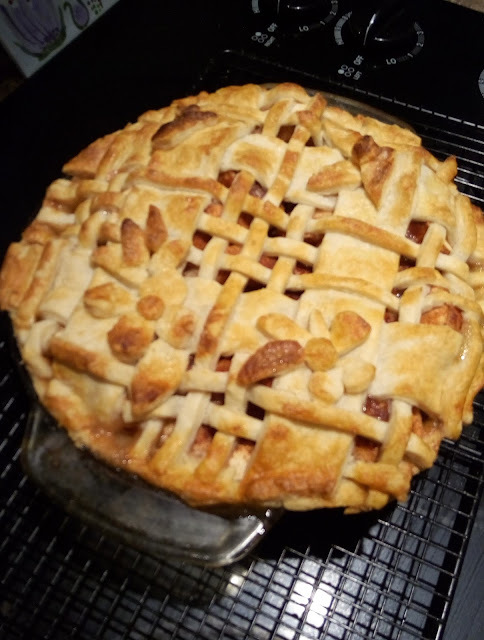 Now, I have to tell you, there were NO booboos in my pie crust. But I used the flowers anyway.